This declaration wes agreed at our Peoples Assembly on May 21 2011. Please bring ammendments to our next assembly. Women, youth and ethnic minorities who will be disproportionately affected. Everyone, who will be hit with higher taxes, pension cuts, and over a million further job losses in both the public and private sector due to austerity and the recession. Yet we didn’t cause this crisis – the bankers did. This is a crisis of the capitalist system. The trillion pound bank bailout and the economic recession caused by the credit crunch, is the root of this debt crisis. But tax cuts for big business, coupled with tax avoidance by the wealthy, means the rich get richer and the hole in the budget gets bigger. Lambeth People’s Assembly rejects the idea of slashing public services completely. There does not need to be a single cut and we reject every single one! Instead, tax the rich, banks and business to protect and extend public services, build council housing and launch an environmentally sound public works programme that will provide useful, well-paid and permanent jobs. The market capitalist economy isn’t working so we should take the banks and big corporations into common ownership. We pledge to fight every cut, locally and nationally, whatever party puts them forward. We call on local councillors and MPs to reject every cut and pledge to campaign vigorously to defend those that vote against cuts from attack. We call on the Labour council to withdraw their £79 billion cuts budget, restore all lost jobs and services and set a “needs” budget instead. We support all workers, students and communities taking action, protests, strikes, occupations, in defence of their jobs and services – whether the action has official union backing or not. We support all workers forced to break the anti-union laws or occupy workplaces in defence of jobs and services. We support direct action to highlight tax dodgers and defend public amenities. And we defend all those attacked by police or prosecuted for taking such action. We support the TUC’s call last year for mass coordinated strike action and campaign for the highest joint action possible, up to and including a general strike to block the entire cuts agenda. We urge all workers to take strike action and support in whatever way possible the coordinated strike action planned for 30 June against cuts in pensions and cuts in general. We reject all forms of division – including racism, fascism, Islamophobia, sexism, homophobia and discrimination on the grounds of disability – that could undermine a united response to the cuts. We pledge to commit ourselves to campaigning against every cut until the entire package is dropped. We aim to build a mass, democratic movement in Lambeth to unite all those who are fighting the cuts as part of the struggle to bring down the Coalition government. We support the setting up of local, campus and workplace anti-cuts groups in Lambeth, specific working groups to fight specific cuts. We request local groups, campaigns and union bodies affiliate to Lambeth Save Our Services and send delegates to our planning meetings. We pledge to build solidarity and links with existing community campaigns and unions and other anti-cuts groups in London. 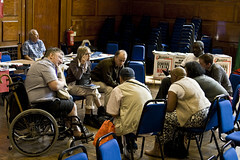 We call on all the anti-cuts groups to work more closely together locally, regionally, nationally and internationally. We pledge to establish the Lambeth People’s Assembly as a focal point for the struggle, reconvene on a regular basis and link up with assemblies in other areas. The following statement was produced out of our first conference in October 2010. This Tory-Lib Dem government has unleashed the biggest attack since the second world war on the welfare state, working people’s living standards and even our right to continue to live in our communities. Lambeth Labour Council is set to pass on these cuts of £40 million, one-sixth of its 2011-12 budget, rather than defend the working people it was elected to represent. Far from being ‘all in this together’ banks, big business and the rich are benefiting from bailouts and profits, bonuses and tax breaks despite causing this crisis in the first place. These cuts are an ideological attack on our society and we will fight back. In this meeting of Lambeth Save our Services we commit ourselves to resisting every single cut to services, jobs, pay benefits and pensions and every single rise in rents, tuition fees and taxes for working class people. We support the students opposing tuition fee rises, the firefighters, tube workers, teachers and housing officers resisting the cuts. We call on Lambeth Labour Party to pass a no cuts budget and mobilise to fight the government for more money. We pledge to make the TUC demo on 26th March 2011 the largest for years. We will organise solidarity with all struggles against cuts and help co-ordinate demos, protests and strikes. 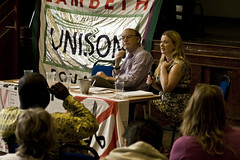 We will build for a converence of all anti-cuts groups in South London in early 2011 and attend national gatherings against the cuts. Union branch secretaries to write an open letter to Steve Reed and all Labour councillors laying out the case for and demanding that the Almo be brought back in house. We will build a Lambeth SOS Education Action Group that links all campaigns across South London, like the Anti Academies Alliance, LSBU Anti-Cuts group etc. We will help support and develop a broad based claimants action group.